Taiwan Semiconductor Manufacturing Co. (TSMC) is reportedly battling with Samsung to secure orders for the "A12" processor, a 7-nanometer chip that is destined for use in a future iPhone generation. While reports earlier this week suggested Samsung had secured a deal to make the processors, industry observers advised to DigiTimes that this may not be the case, based on TSMC's technology. The in-house developed InFO wafer-level packaging created by TSMC will make the firm's 7-nanometer FinFET technology more competitive than Samsung's equivalent, the observers told the report. The introduction of TSMC's second-generation technology, which is said to play a key role in chip production, will apparently make Samsung's chances of regaining application processor orders for a future iPhone "unlikely." Tuesday's reports about Samsung's deal cites sources claiming one of the South Korean electronic giant's three co-CEOs visited the Apple headquarters in June, with the company allegedly using its close ties to OLED production as part of its persuasion effort. Samsung is also said to be close to completing testing of its new equipment for producing chips under a 7-nanometer process, in anticipation of receiving a final approval from Apple. On Wednesday, a report surfaced claiming TSMC had started expanding its equipment suppliers, in order to implement a more efficient 7-nanometer process from 2018. 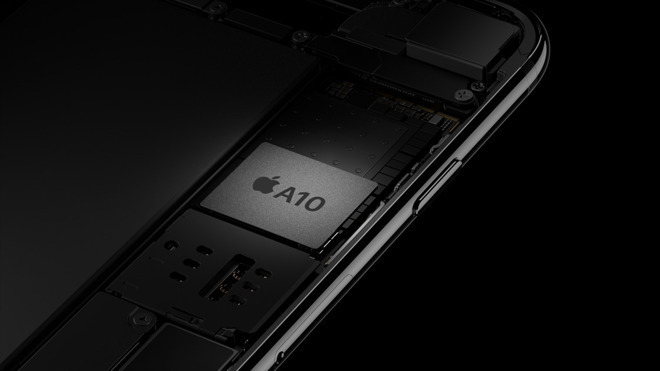 TSMC is said to be producing processors for the "iPhone 8" expected this year, with the "A11" chip thought to use the company's 10-nanometer process. While it is possible for Samsung to take on some of the orders for the "A12" chip, it is unlikely for Apple to completely switch away from TSMC, though it is plausible for Apple to split the order between the two firms while they embark on using the relatively new 7-nanometer process. Apple has used both TSMC and Samsung as processor suppliers, with the A9 used in the iPhone 6s produced by both companies, but since then, Apple has solely used TSMC for its A-series chips. A switch to a smaller die size, such as the move from a 10-nanometer to a 7-nanometer process, typically introduces a number of benefits linked to squeezing faster processing technologies into a more confined space. Aside from a speed boost, this can also make the processors more power efficient than previous generations, in turn increasing battery life.